One of the UK's leading packaging manufacturers had been experiencing problems with an increase in downtime, and in particular the time taken to repair machinery was slow and increasing costs. This problem was largely a symptom of the maintenance team's poor approach to fault finding and not to do with their technical knowledge. 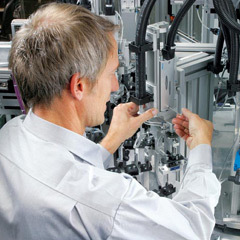 Our client had previously used Festo in the past for standard technology based training courses, but in this case felt the downtime issue needed to be directly addressed with a bespoke 'Fault finding' course. Festo's Didactic's Graham Spencer, Senior Instructor, organised a two day off site locally held course, so that the maintenance team could avoid being interrupted unless absolutely essential. In order to provide all the maintenance team with a common structured systematic approach, Graham devised a 5 step process in order to speed up repair time and ensure that the team thought carefully about the cause and root causes were before acting to repair the fault itself. With the new five step process in place, the client has immediately benefited from a decrease in downtime, along with costs. Furthermore, the team now have a improved and harmonised reporting procedure leading to increased awareness and understanding of the fault finding processes and a quicker repair process. "Good practical rigs to fault find on and improve skills." "It will make you stop and think, before just acting on instinct."